The first part of the doubleheader saw Super Smash Brollers (SSB) take on South Wales Silures (SWS). Travelling all the way from Cardiff they bought the weather with them – the sky outside was as grey as their kit. The choice of colour meant that the NSOs couldn’t wear their trusty grey tops, so instead turned up in dashing red. Some were more dapper than others; Yan Dam looked like he might steal the show as jam timer. The boys in blue got off to a fantastic start, within the first couple of minutes they were leading 25-9. It seemed SSB had improved their game play following the last game against Quads of War! 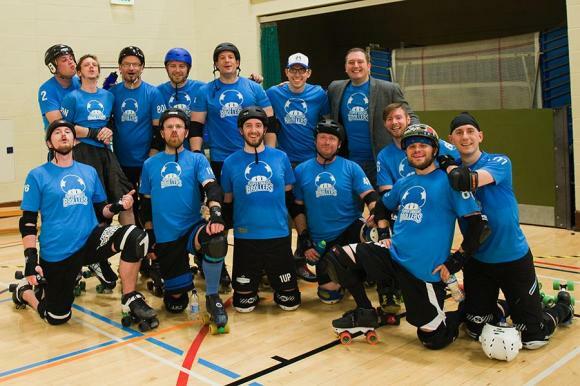 Unfortunately, the lads weren’t able to capitalise on this success and SWS soon pulled it back, demonstrating why they came second in the Men’s Roller Derby European Cup. At the hands of the larger SWS blockers, Dark Side of the Boon was regularly thrown around like a Weeble; he fell but bounced straight back up in true Broller spirit. With a high level of fierce contact the penalty box was rarely empty, reducing the number of players on track which evidently troubled the Brollers more than SWS. With both jammers in the penalty box at the start of the whistle, the officials had some serious thinking to do. 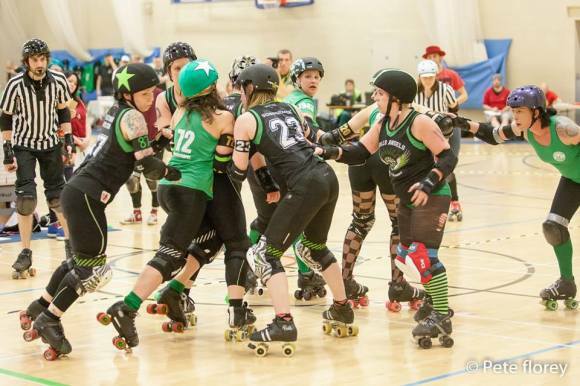 Eventually the SWS jammer sat in the penalty box for ten seconds, then Brawl Jukes suffered a ten second penalty followed by a further thirty seconds permitting a stronger lead for SWS. Six minutes into the second half, Boon left the game with an injury. Bad luck for him but good luck for the rest of the Brollers as it meant he left before fouling-out saving them a penalty; that’s taking one for the team! 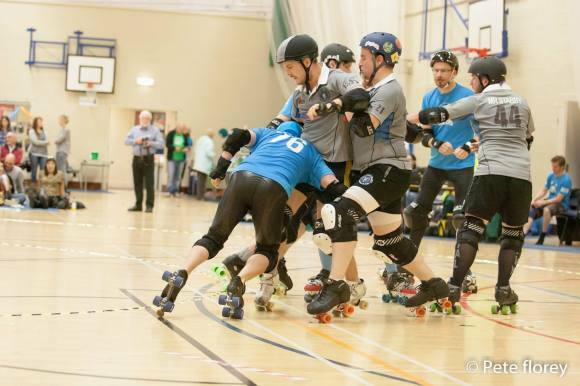 Things weren’t looking good for the Brollers in the second half but they gave their all; Skate Plissken in particular deserves a mention for breaking through the pack to rousing applause. There was some spectacle from SWS as well, The Machinist pulling off a couple of impressive apex jumps. All in all it was a great game to watch, the Super Smash Brollers gave their best but the superior skill and teamwork of South Wales Silures meant they came away with a well-deserved win. 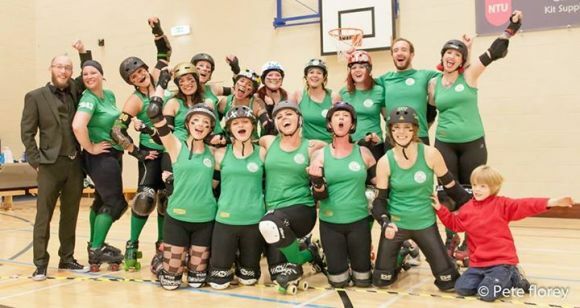 The second game of the day saw the home team, Nottingham Roller Girls (NRG), take on Hulls Angels Roller Dames (HARD) who certainly lived up to their acronym! Initially, the home team looked confident but HARD certainly didn’t take any prisoners, picking up 14 points to 0 in the first jam. The next few jams saw the score rise 9-41 with superb solid walls and nimble jamming from Claud Apart and Iron Giant. The start of the breakthrough for NRG came in jam 11 with some excellent positional blocking from Cherry Revenge and a forced cut track from The Ruth Hurts, resulting in two consecutive power jams for NRG. The next few jams gave few points to either team but an illegal procedure from HARD’s Victorious Affliction saw her face quadruple recycling from Greek Frightening. P0P5 used the opportunity to generate a lead change 51-45 and a failed star pass from HARD in the subsequent jam saw NRG’s Hell ‘n’ Back raise it to 69-45. With five minutes remaining in the first period, HARD fought back with tactical ‘calling’ seeing the score raise to a nail-biting 69-68. Awesome skills from Dr Blockson limited the effectiveness of the NRG power jams which saw a fierce battle in the final jam of the first half. Both teams came out fighting in the second half but with heavy penalties and HARD’s effective walls, the score rested at 93-150. NRG stayed positive and passed the 100 mark in jam 14, with notable big hits from Lozferatu, Natastrophe and Moseph. It was clear that HARD’s spot in the league tables was well earned as they stepped it up a gear, doing ‘the thing’ and scoring the points. Despite the last two jams of the game seeing a 25 point gain….